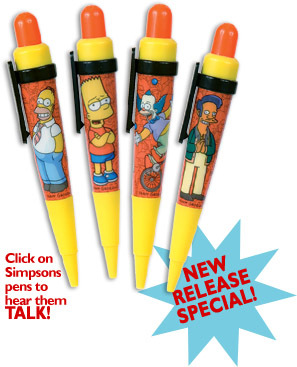 Simpsons Quotes, Merchandise - collectible talking pens - Homer, Bart, Apu, Krusty! Hear Your Favorite Simpsons Quotes Anytime You Want! Listen to your favorite “The Simpsons ” characters spout hilarious one-liners from their pen. Hear Homer, Bart, Krusty, and Apu! Each pen features one of your favorite characters from “The Simpsons,” and plays five of their greatest lines from the last 18 years! The high-quality audio is taken right from the actual soundtrack! Enjoy hearing these great lines from “The Simpsons” anytime, anywhere!